SAFETY VALUE QUALITY INNOVATION ﬁﬁﬁﬁﬁﬁﬁﬁﬁﬁﬁﬁﬁﬁﬁﬁﬁﬁﬁﬁﬁﬁﬁﬁﬁﬁﬁﬁﬁﬁﬁﬁﬁﬁﬁﬁﬁﬁﬁﬁﬁﬁﬁﬁﬁﬁﬁﬁﬁﬁﬁﬁﬁﬁﬁﬁﬁﬁﬁﬁﬁﬁﬁﬁﬁﬁﬁﬁﬁﬁﬁﬁﬁﬁﬁﬁﬁﬁﬁﬁﬁﬁﬁﬁﬁﬁﬁﬁﬁﬁﬁﬁﬁﬁﬁﬁﬁﬁﬁﬁﬁ ﬁﬁﬁﬁﬁﬁﬁﬁﬁﬁﬁﬁﬁﬁﬁﬁﬁﬁﬁﬁﬁﬁﬁﬁﬁﬁﬁﬁﬁﬁﬁﬁﬁﬁﬁﬁﬁﬁﬁﬁﬁﬁﬁﬁﬁﬁﬁﬁﬁﬁﬁﬁﬁﬁﬁﬁﬁﬁﬁﬁﬁﬁﬁﬁﬁﬁﬁﬁﬁﬁﬁﬁﬁﬁﬁﬁﬁﬁﬁﬁﬁﬁﬁﬁﬁﬁﬁﬁﬁﬁﬁﬁﬁﬁ ﬁﬁﬁﬁﬁﬁ ﬁﬁﬁﬁﬁﬁ ﬁﬁﬁﬁﬁﬁﬁ ﬁﬁﬁﬁﬁﬁﬁ ﬁﬁﬁﬁﬁﬁﬁ ﬁﬁﬁﬁ ﬁﬁﬁﬁﬁﬁﬁﬁﬁﬁﬁ ﬁﬁﬁﬁﬁﬁﬁﬁﬁﬁﬁ ﬁﬁﬁﬁﬁﬁ ﬁﬁﬁ ﬁﬁﬁﬁﬁﬁﬁﬁﬁ ﬁﬁﬁﬁﬁﬁﬁ ﬁﬁﬁﬁ ﬁﬁﬁﬁﬁﬁﬁﬁﬁﬁﬁﬁﬁﬁﬁﬁﬁﬁﬁﬁﬁﬁﬁﬁﬁﬁﬁﬁﬁﬁﬁﬁﬁﬁﬁﬁﬁﬁﬁﬁﬁﬁﬁﬁﬁﬁﬁﬁﬁﬁﬁﬁﬁﬁﬁﬁﬁﬁﬁﬁﬁﬁﬁﬁﬁﬁﬁﬁﬁﬁﬁﬁﬁﬁﬁﬁﬁﬁﬁﬁﬁﬁﬁﬁﬁﬁﬁﬁﬁﬁﬁﬁﬁﬁﬁﬁﬁ ﬁﬁﬁﬁﬁﬁﬁﬁﬁﬁﬁﬁﬁﬁﬁﬁﬁﬁﬁﬁﬁﬁﬁﬁﬁﬁﬁﬁ ﬁﬁﬁﬁﬁﬁ ﬁﬁﬁ ﬁﬁﬁﬁ ﬁﬁﬁﬁﬁﬁﬁ ﬁﬁﬁﬁ qﬁﬁﬁﬁﬁﬁﬁ ﬁﬁﬁﬁ ﬁﬁﬁﬁﬁﬁﬁﬁﬁﬁ ﬁﬁﬁ ﬁﬁﬁﬁ ﬁﬁﬁﬁﬁ ﬁﬁﬁﬁ ﬁﬁﬁﬁﬁﬁﬁﬁﬁﬁ ﬁﬁﬁ ﬁﬁﬁﬁﬁ ﬁﬁﬁﬁ ﬁﬁﬁﬁﬁﬁﬁﬁﬁﬁﬁ ﬁﬁﬁﬁﬁﬁﬁﬁﬁﬁﬁﬁﬁﬁﬁﬁﬁﬁﬁﬁﬁﬁzﬁﬁﬁﬁﬁﬁﬁﬁﬁﬁﬁﬁﬁﬁﬁﬁﬁﬁﬁﬁﬁﬁﬁﬁﬁﬁﬁﬁﬁﬁﬁﬁﬁﬁﬁﬁﬁﬁﬁﬁﬁWﬁﬁﬁﬁﬁﬁﬁﬁﬁﬁﬁﬁﬁﬁﬁﬁﬁﬁﬁﬁﬁﬁﬁﬁﬁﬁﬁﬁﬁﬁﬁ ﬁﬁﬁﬁﬁﬁﬁﬁﬁﬁﬁﬁﬁﬁﬁﬁﬁﬁﬁﬁﬁﬁﬁﬁﬁﬁﬁﬁﬁﬁﬁﬁﬁﬁﬁﬁﬁﬁﬁﬁﬁﬁﬁﬁﬁﬁﬁﬁﬁﬁﬁﬁLﬁﬁﬁﬁﬁﬁﬁﬁﬁﬁﬁﬁﬁﬁﬁﬁﬁﬁﬁﬁﬁﬁﬁﬁﬁﬁﬁﬁﬁﬁﬁﬁﬁﬁﬁﬁﬁﬁﬁﬁﬁﬁﬁﬁﬁﬁﬁ! ast winter, when I was invited to sail across the North Atlantic with my friend Steve aboard his ultra modern Hanse 505 cruising boat, some of my old friends raised their eyebrows at the thought of taking a very beamy, light, fin-keeler with a skimming dish hull out into the possible fury of the northern latitudes. What lay behind their skepticism was the notion that good sea boats need to sail in the water—displacement hulls—instead of on top of the water—light displacement hulls. The former will be more comfortable and safer, it was contended, while the later will be, well, possibly dangerous. If you are reading this, then you are a sailor, and you know that sailors tend to form strong opinions of matters like this and are very slow to accept new ideas, new designs, new tricks. They are, or we are, old sea dogs and we don’t like new tricks. But, unlike my old friends, I didn’t question Steve or the boat or the idea of sailing it across the North Atlantic. In this job at BWS, I get to sail a lot of new boats and have many opportunities to sail modern boats offshore. So, I knew something about light-displacement, fin-keel designs and how they work at sea. And, I’d owned a Jeanneau 45.2 for a decade or so and sailed it some 16,000 miles offshore through all types of weather. It was fine and so would be the Hanse 505. But these modern designs are not like the boats I voyaged on years ago, boats that would have been given the seal of approval by the old sea dogs. I crossed the Atlantic the first time on a Little Harbor 50, a heavy displacement design that had a nice slow motion. Then I sailed a Tahiti ketch—full keel, double ender—across the Pacific. It too had a slow motion and rolled a lot. Then I sailed my Mason 43 around the world—full keel, attached rudder, long overhangs—and it also had a slow motion at sea. The Mason 43’s average speed was 5.5 knots. As you can see, the operative word here is slow. So, what was the Hanse like sailing across the North Atlantic? Well, it was the opposite of slow. It was fast and quick, very like my Jeanneau. Steve had put quite a few miles on his boat and estimated that we would average 8 knots over the 3,100-mile passage. That did not surprise me. On a trial sailto-nowhere shakedown before the passage, we sailed straight offshore for 12 hours and then turned around. We had a bit of breeze and at one point crew member Henry remarked, “We don’t have to figure out how to make the boat go fast, we have to know how to slow this beast down.” And that’s what we did whenever the wind and seas got up during the passage. The Hanse would start leaping forward like a race horse and accelerate to nine and 10 knots. The big stern would begin to corkscrew in the waves and the flat underwater hull shape forward would slam as we leaped over waves. To preserve our sanity and to avoid breaking anything, we reefed and reefed and reefed until we had her calmed down and sailing right on eight knots. Perfect. When he did the math after making landfall in England, Steve announced that we had not averaged eight knots for the trip as predicted. We had, in fact, averaged 7.8 knots. In my book, that is fast passagemaking and we did it in complete comfort by slowing down. Rates for one year): $29.95 in the United States; $44.95 for Canadian subscriptions; $64.95 (air) for all other foreign. No foreign currency checks accepted. US$ only. Blue Water Sailing is copyrighted 2018. All rights reserved. Reprinting, photocopying or excerpting passages is forbidden except by permission of the publisher. Postmaster: Send changes of address to: Blue Water Sailing, P.O. Box 3000, Denville, NJ 07834-3000; Canadian Publications Mail Agreement # 41760516. Return Undeliverable Canadian addresses to P.O. Box 122, Niagara Falls, ON L2E 6S8. 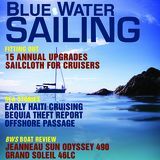 Email Address custsvc_bluew@fulcoinc.com Ph: 866-529-2921 Blue Water Sailing USPS No. 014597 ISSN No. 1091-1979 is published monthly except in December, February and July by Day Communications, Inc. 747 Aquidneck Ave., Middletown, RI. Periodicals Postage Paid at Newport RI 02840 and additional mailing offices. W A N D E R ARE LOST. Bill Biewenga, 4 time Round The World race veteran, a f t e r a n O u t b o u n d t r a n s a t l a n t i c d e l i v e r y.
THERE’S A LOT OF LIFE IN ONE BATTERY The widest range of premium, long lasting deep cycle marine batteries. NO 720S. NO OFFSET MARKS. NO OCS. .
No, you don’t race. Yes, you sail. That’s good because Harken makes products for sailors. Take for example, our new Element blocks: aluminum sideplates forged into compound curves for strength, paired with a bearing system proven to deliver for years. Compare them to plastic plain-bearing blocks from competitors—you’ll be surprised. Element. 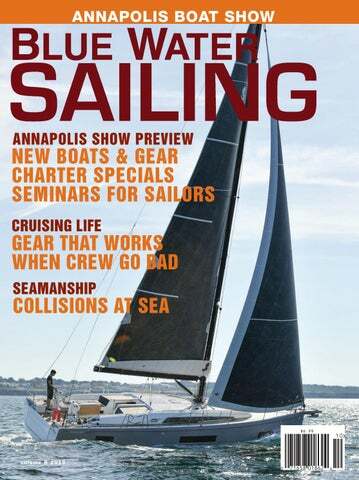 Harken design, engineering and quality—priced for sailors. old cotton tee shirt or piece of cotton string. Cotton, unlike synthetic material, will absorb water and swell to fit the hole, thereby cutting off the supply of water. Having a few cotton tee shirts around or some cotton string in your pocket may be just the ticket to solve your problem. Larger holes may require something else. Onboard Great American II, when Rich Wilson and I set the San Francisco to Boston and New York to Melbourne, Australia records, we had a 3’ x 4’ sheet of 3 ply fiberglass made for us. It was flexible enough to stow against any bulkhead and didn’t take up much space. We also carried a couple of tubes of 5200 marine adhesive which will kick off in the presence of salt water and a bag of stainless steel self-tapping screws. SPLICE LINE LIFELINE HARDWARE Our new Splice Line fittings allow you to easily splice hi-tech Dyneema™ line to standard lifeline fittings. These new Spice Line fittings are machined out of 6061-T6 aluminum and then hard anodized. They are designed to be light weight and easy on the line. A cruising couple decide to take crew with them for the 3,200-mile passage across the South Pacific from the Galapagos to the Marquesas. It didn’t go well by Patricia Gillette, PhD would take on additional crew was initiated. We read ads and talked about the pros and cons several times. We had already had several six-to-nine-day passages and did well with the just the two of us. Yes, it is physically draining but one does adjust. But, we both missed the social interchange with other people. â&#x20AC;&#x201C;April 30. Four days before takeoff we were approached by a young French woman, Bene, who said that she and her boyfriend were looking for a boat to travel on to the Marquesas. Ultimately, they wanted to go to New Zealand and wanted to enjoy the sailing experience to the Marquesas. Sam, the other half, said he had been in a sailing training program in France and had blue water experience bringing a boat from Martinique to France, which is not a small trip. As David and I were open to the idea, we invited them to visit our boat the next morning to explore the idea more. At that time, we asked several questions about their experience (his more, her none), their health (no issues) and their expectations (just to get to the Marquesas). on the spreaders when jibing and, as it is quite fragile, can easily rip on our radar reflector. As David and I realized what he was doing, we told him to stop. But we were too late; the sail ripped in several places on the radar reflector. Sam immediately responded that he had not done this. Not a good sign that he tried to warp reality? How does one check for this? The next day, David and I spent several hours repairing the spinnaker and re-stuffing it in the sock. Bene then stated she was unable to stand up and felt very weak. We all agreed that this was part of adjusting to life at sea. This was not unusual except that her horizontal position was in the cockpit and, as we were changing sails frequently, we would have to constantly ask her to move, which she refused to do. I explained to her that she needed to be more aware of what was going on in the cockpit and I suggested to her that getting more involved could facilitate her adjustment process. happening. We did request that Sam and Bene take their normal shift. Sam’s response was good, “We can all learn from our mistakes” so it was left at that. David was on the last shift and reminded Sam to wake us up if anything occurred. Both David and I fell into an exhausted sleep and were both aware of the boat going fast. We woke up at 0600 and looked on the chart. When we went to bed at midnight, we were 136 nm from Hiva-oa. Through the night, we had sailed 73 miles and should have been within 63 miles of the island, with plenty of daylight to make landfall. However, our location that morning was more than 86 miles northeast of our destination. Sam said he thought about waking us but then decided not to as we had initially set the course and so it must be ok. Thank God the winds were strong and in our favor. We arrived in port at about 1900 that day and were met by the local Emergency Response Team who towed us into the harbor. Sam and Bene had their bags packed and were off the boat as soon as we cleared Customs and Immigration the next morning. Would we ever take on crew we didn’t know again for an offshore passage? The answer is simple: “No.” BWS Patricia Gillette and her husband David have crossed the Indian Ocean and are cruising the East Coast of Africa. ing yarns will be protected in the tropics. Much of your decision on what to use for fabric and engineering will be driven by your budget. While the thought of an exotic high-tech mainsail might be appealing letâ&#x20AC;&#x2122;s not forget that Dacron has been used very successfully for decades and if your budget is limited, by all means choose crosscut Dacron. For those that have the budget and choose more highly engineered sails you will see a big jump in performance and over the life of the sail they will have a better shape across a broader set of conditions. BWS Sailmaker, circumnavigator and raconteur, Brian Hancock owns Great Circle Sails and makes his home in Marblehead, MA. approaches over the outer reefs, and verify waypoints and routes provided by others. Always have backups for backups; you never know which system or software some big thumbs might damage. and controller to purchase last year, and it’s been a great improvement to Brick House. In the same footprint as our 25-year-old solar panels, we now have the technology to more than double solar energy generation, which is wonderful since our power consumption is always increasing. The people at altestore are not just solar experts, but sailors too. Check out their videos, which are very helpful. tation for creating fast racing boats and competitive offshore racers for French singlehanders. The speed gene was obviously passed on to the new 51.1 and 46.1. The design has a shallow draft hull with a lot of volume in the forward sections and then the maximum beam is called all the way aft to the transom. This type of hull offers a huge interior volume for the accommodations, plus it provides a lot of initial stability so the boat will sail very flat. The hard chines also add volume and stability. Under the water the standard keel in a L-shaped fin that has a low center of gravity, which adds to ultimate stability and the boatâ&#x20AC;&#x2122;s ability to carry sail as the wind increases. The twin rudders have a very positive bite on the water and make the boat feel like it is sailing on rails. We all noticed that the helm was balanced and getting the boat into the groove upwind was easy. The cockpit is well laid out for both sailing and comfortable outdoor living. All lines and sheets run to winches on both sides of the cockpit, so one person can steer and trim at the same time. and the dinette and a bench settee are amidships. You can opt for a three-cabin, three-head plan that moved the galley forward to the port side so a head can be fit into the space the aft galley had been. You can also opt for a four-cabin, four head configuration or even go with a five-cabin, three head plan. For a couple who cruise mostly on their own and are visited from time to time by friends or grown children, the three-cabin-two head plan with the galley aft, makes the most sense. The ambience of the new 46.1 below decks is of bright natural light that streams in through large hull windows, deck hatches and cabin-side windows. The use of light-colored veneers and pale fabrics adds to this impression of lightness and open space. The interior designers worked hard on the lighting systems down below, so you can create both mood lighting and full lighting for cooking or reading. The saloon will work well for entertaining or for quiet evenings at anchor with a good book. Sunbrella, Top Gun, Top Notch, Odyssey and more. FEAR NO HORIZON. The Jackline Insurance Program by Gowrie Group & IMIS provides cruisers with the insurance protection needed to roam freely and navigate the globe. Lowest drag, 100% reverse thrust. Unique overdrive. fabric shelters • Sun/Rain awning, self supported, no halyard. • Rigid, folding, flexible frame. “Stands on lifeline”. • Waterproof, marine grade construction throughout. • Easy up & down. Stows complete in 10"x36" bag. • Designed for use in true cruising conditions. • Stock models for up to 50ft LOA $300-$800. • Custom designs also available. With a combined experience of 665,000 miles and 81 years, John and Amanda Nealâ&#x20AC;&#x2122;s unique curriculum offers you a dynamic hands-on learning experience including seamanship, navigation, storm avoidance and heavy weather tactics. twenty-mile passages, slicing through the sea at a rate of knots. so take control of your next adventure from dock to deepest blue. TWO NEW BASES TO EXPLORE DISCOVER OUR NEW BASES IN ST. LUCIA AND BELIZE Dream Yacht Charter are world leaders in charter vacations. With over 1000 yachts in over +50 locations, we offer high quality, personalized experiences. To help tailor your experience, our fleet is made up of the widest selection of models and manufacturers. We have a boat to suit every type of sailor and we update our fleet regularly with the latest premium monohulls and catamarans. We have over 100 new yachts that will be joining our 2018 worldwide fleet, including Fountaine Pajotâ&#x20AC;&#x2122;s Lucia 40 and Saona 47, Dufour 382, 412, 460, and 520, as well as Lagoon 40 and 50. Call to speak to one of our expert charter consultants or visit our website today. IYC is the official Caribbean Dealer for Blue Jacket Yachts. solar panels aboard all our vessels. Your Ticket to Fun Come for the show, leave with a lifestyle. Over 250 sailboats, including over 60 multihulls from 12 manufacturers!